Fingal Libraries have organised a Work Matters Expo taking place in Balbriggan and Blanchardstown libraries from the 13 – 23 of November. 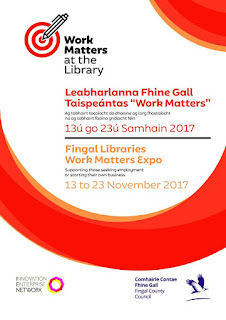 The programme includes a variety of guest speakers, interactive workshops and an exhibition of employment and enterprise support agencies. Work Matters will offer advice and support to those who are looking for a job, a career change or are thinking of starting their own business. All of the events are free to attend and everyone is welcome.